Our friends at Kobo today launched a massive site-wide promotion featuring 200 titles exclusively supplied by 159 Smashwords authors. It's a "3 for the Price of 2" promotion where customers can purchase two participating titles and get the third title for free. The promotion runs now through November 9 in Kobo's US and Canada stores. The promotion is tightly integrated throughout the Kobo store. It's quite impressive how they're handling it. The promotion is prominently featured at the top of the Kobo home page and on a dedicated promotion page at https://store.kobobooks.com/p/SW3f2US. 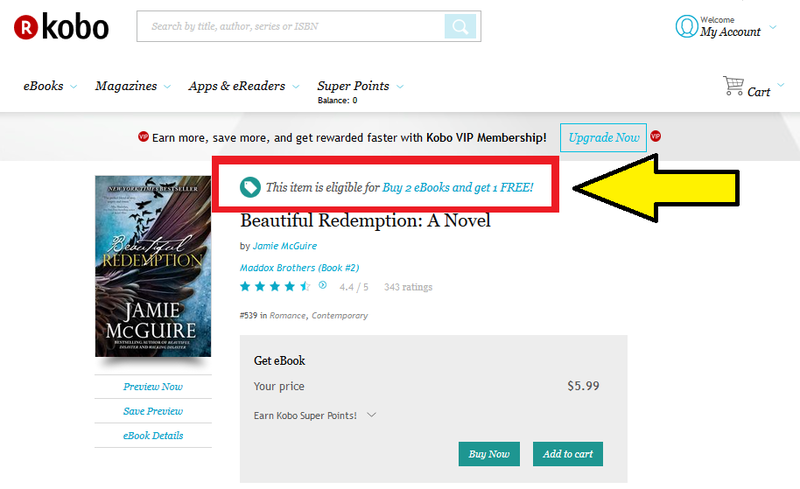 The promotion will also be promoted in multiple email blasts to Kobo customers and integrated within customer shopping carts. The promotion page at https://store.kobobooks.com/p/SW3f2US is impressive in its design. The page presents large beautiful images of the covers. A one-click search filter makes it easy for customers to view participating titles by bestseller rank (the default view), by highest rated, by alpha-sort or by date of publication. Beside each title is a little "add to shopping cart" icon. A simple click adds the book to the customer's shopping cart without taking the customer away from the promotion page. This makes it easy for customers to go click-click-click as they fill their carts with these amazing books. Customers browsing the individual book pages of any of the 200 participating books will also be drawn in to the overall promotion because participating books are noted by a green tags. At left, I share a screen shot of how the individual book pages look, using a participating title from Jamie McGuire as an example. Merchandising language above the title of each participating book encourages the customer to buy this and other books participating in the promotion. So if you think about it, all 200 of these books will be driving customers into the promotion and promoting the other 199 books. Juicing the promotion further, many of the participating authors will be promoting the promotion to their fans who shop at Kobo, thereby introducing their fans to 199 other great books from 158 other great Smashwords authors. 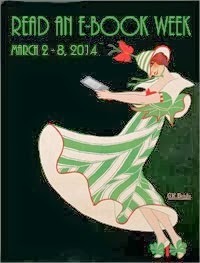 My hat goes off to our friends at Kobo for the months of work that went into the planning and launch of this fabulous promotion. I'm also thankful for all the great work they do every day to support Smashwords authors and publishers. This is one of our most ambitious and complex promotions to date with a retail partner. At the bottom of this post, I'll share some details on how these titles were selected. Please join me in congratulating the authors with titles selected for this promotion. I've noted the participating authors below along with the featured titles. Please visit https://store.kobobooks.com/en-us/p/SW3f2US and buy these books! Pauline O`Brayn - ¿Quién decide cuánto duran los besos? It was tough but fun project that spanned multiple months of work. A few months ago, Kobo asked me to recommend up to 200 titles for the promotion. Unlike many retail promotions where we're often looking for free, discounted or low-cost books, or top-performing preorders, for this promotion we favored published books priced $3.99 and higher. So this excluded free series starters as well as follow-on series books because it wouldn't make sense to fill the promotion with a lot of "Book #2s" in a series. We wanted to help authors put a great foot forward under the assumption that for many Kobo customers, they'll be discovering these authors for the first time. We want to put smiles on the faces of Kobo customers! Series starters with a price of $3.99 or higher were welcome and received some priority because what better way than a great series starter to introduce readers to a new author? Smashwords authors who linked their series with the Smashwords Series Manager tool had an advantage here because it made it possible for us to surface our bestselling series that have series starters priced $3.99 or higher. On top of this, we also wanted box sets within the price parameters because a box set would allow us to give Kobo customers a complete introduction to these these great writers. Authors who followed our previous recommendations and tagged their box sets with our enhanced box set metadata option had a big advantage here because it made it easy for us to identify our bestselling box sets within the parameters mentioned above. To narrow our search from 380,000 titles to 200, we analyzed the recent 6-month sales track records of Smashwords authors with books that fit our parameters. This allowed us to apply the fairest selection criteria based on merit. Authors who fully distribute with Smashwords had an advantage here, because if an author uploads direct to B&N or iBooks, we can't verify and count their sales, and if we don't distribute them to Kobo we obviously couldn't include them in the promotion because we didn't have the right to distribute them. Once we surfaced the broad list of candidates, we secured Kobo's approval for our proposed list (they approved all our titles) and then we worked with the authors to secure their approvals. Unfortunately, some of the authors we invited had non-working email addresses attached to their accounts, so those authors were dropped. We also dropped a bunch of other authors because although we nominated (and Kobo accepted) their books early in the process, by the time we contacted them for their aproval some of them had unpublished their books to enroll them in KDP Select. Oops. The silver lining to their missed opportunity was that it opened up more room for other great authors who maintain wide, uninterrupted distribution. Again, my thanks to Kobo for organizing this promotion, and my thanks to the participating authors for their awesomeness! Many thanks to Kobo for the promotion, and to Smashwords for the selection! I'll start letting the fans know. PS: The sequel to "The Enlisted Men's Club" is on the way. What a fantastic promotion! Many thanks to both Smashwords and Kobo. What a wonderful promotion with so many excellent books featured! Thanks so much Mark and especially Kobo!! Thanks for the promo, Kobo. And kudos to Smashwords for once again running a great promo for their authors. Thank you, Kobo and Smashwords! This is a great promotion and I'm proud to be part of it. Thanks, Mark and the folk at Kobo, for including Daisy's War in this promo! 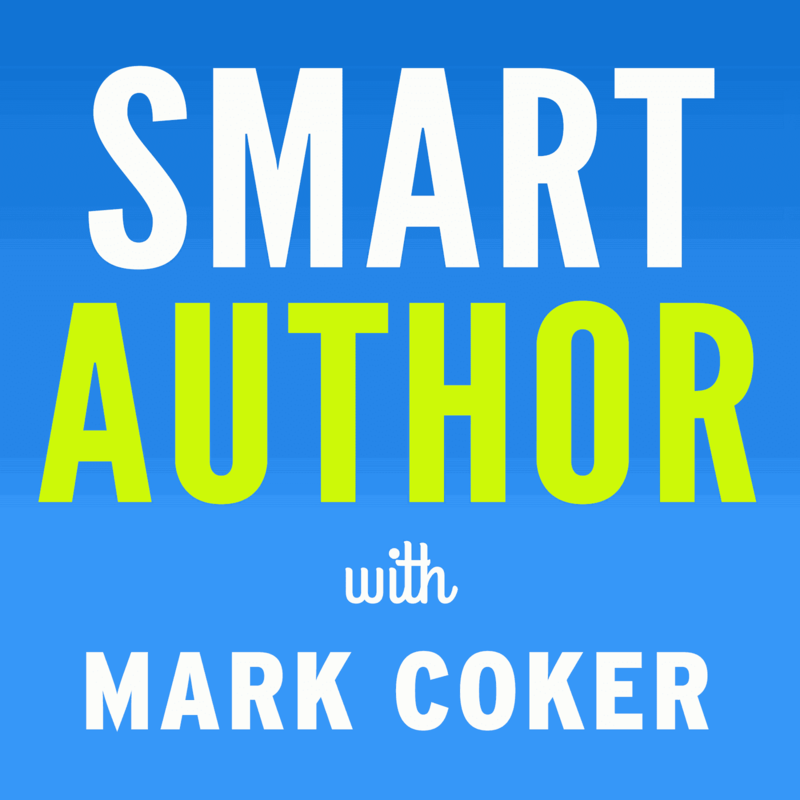 Kobo and Smashwords rock! I'm so grateful for the opportunity and can't wait to share this news with my readers! Thank you Smashwords and Kobo for including Deadly Mates in this awesome promotion! Thank you Kobo and Smashwords! Truly appreciate you including the Grey Wolves starter bundle in your promotion!! This is so great! Huge thank you to you Mark and huge thank you to Kobo as well! I appreciate this! Just came back from an overseas trip and this announcement was the best welcome home! Thank you Kobo and Smahswords for making the Witness Series and Josie Bates part of this great promotion. What a great opportunity and a win win for both readers and authors! Thank you Mark and Kobo, for including Wild Marauders MC in this promotion. I truly appreciate it. Thrilled to be included in this promotion! Thanks so much Mark and thank you Kobo! My thanks to Kobo and Smashwords for including my DIRE Agency Trilogy in this promotion! I'm humbled and honored to have been selected. I appreciate the opportunity! I'm honored to be included in a list with so many great authors. I also enjoyed seeing how the books were selected. The behind the scenes look was very enlightening and gave me some ideas. Thanks! Thank you Kobo and Smashwords for including me in the promotion! What an amazing opportunity - thanks again! Thrilled to have Making Choices included in this exciting and groundbreaking promotion. Many thanks to Kobo and Smashwords for the opportunity! You guys rock!! Thank you so much Kobo and Smashwords for such an awesome promotional opportunity! I know the readers will love it! Thank you so much Kobo and Smashwords for featuring The Possibility of Trey in the 3 for 2 promo! What an honor to be included in the mix of some truly GREAT writers. YAY! Thank you Kobo and Smashwords for featuring Love, Lies & Deception in this awesome deal! I'm so honored to be a part of it! I'll definitely be sharing this to my readers!! Thanks so much for featuring the Wide Awake series Boxset, Kobo and Smashwords! #YoureTheBest I'll definitely be sharing with my readers so they can grab this a-maz-ing deal. Thank you so much for including my Savannah Young contemporary romance, The Wilde One. I am so honored to be a part of this wonderful promotion! Thanks for the post, Mark. Looking forward to Monday to see how this does! This is wonderful, Kobo and Smashwords. Thanks so much for featuring BLOOD AND SNOW COLLECTION 1. You rock! Congratulations to all the authors-awesome! This is a huge leap and I honor Smashwords' commitment to their authors and to independent publishing. Thank you to Kobo too!